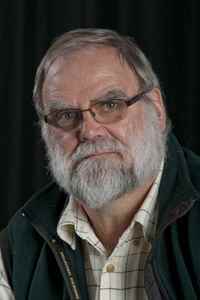 The Subversive Archaeologist: Iain Davidson Guest Comment: Seafaring Neanderthals? Iain Davidson Guest Comment: Seafaring Neanderthals? I'm very pleased on this Friday to introduce the Subversive Archaeologist's good friend, Iain Davidson. He has a few words to say about the just-announced claim that Neanderthals were paddling around the Ionian islands in boats even before boats were invented. But before I turn you over to Professor Davidson, I think it only host-worthy of me to give you a little bit of his background and, I suppose, his credentials for commenting on Ferentinos, et al. 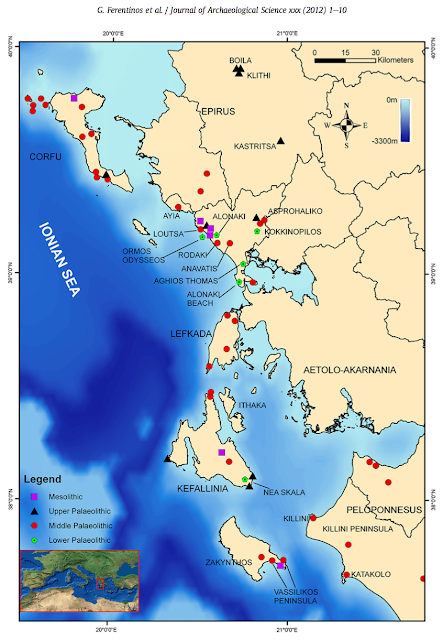 's 'Early seafaring activity in the southern Ionian Islands, Mediterranean Sea', the latest bit of real archaeological science from the Journal of Archaeological Science's Very Serious Referees and Editors. Since before he and I became acquainted in about 1988, Iain and I have shared what I facetiously refer to as an 'intellectual pathology.' We both think that a lot of the claims for modern-human behaviour in the Middle Palaeolithic are misguided at best, misinterpretations for the most part, and, at worst, mythical. Iain has recently retired from his Professorial duties at the University of New England, in Armidale, New South Wales, where he plied his trade for several decades. His research and fieldwork have spanned the length and breadth of Australia, from the dream time to the European occupation. He has expertise in, among other fields, animal bone archaeology, taphonomy, lithic replication and lithic analysis (including having to do with the Near Eastern Middle Palaeolithic). He has published a good number of books, including a ground-breaking treatment of cooperative ties with Aboriginal groups. But the ones that are most closely connected with our favorite subject are one on the evolution of cognition and language and another on the relationship between lithic 'technology' and how we became human. [By the way, Iain, I had to put technology in inverted commas, because technology is a word that implies mindedness, and as you know, it's still an open question whether it existed throughout the history of stone artifact production.] If you check out the Subversive Archaeologist's Emporium, you'll see Stone Tools and the Evolution of Human Cognition, and a 'little' volume titled Human Evolution, Language, and Mind, which has been virtually ignored by all the wrong people, who seem disposed only to listen to Very Serious linguists like Steve Mithen. Iain and co-author William Noble got it right--I won't say the same for the competition. So, as you read Iain's comments, keep in mind that he's seen more lithics in situ, and studied the archaeology of Europe and Australia for more years than you and I've had hot dinners [that last bit might have been a slight hyperbole]. I received this from Iain this afternoon, after what was surprisingly little prodding. This is a very careful study of the bathymetry by a team well qualified to do that. I am less certain that the authors are on top of the issues about archaeology. But we are used to that by now. What can possibly be difficult about archaeology? So let us ask some questions. Where are the artefacts? One of the island sites is said to be Lower Palaeolithic. My antennae immediately send me a signal. How are these artefacts being attributed? It is, by now, well established that it is not as straightforward as it once seemed to attribute surface finds to any of the subdivisions of the palaeolithic. What is needed is well-stratified finds from well-dated strata before we can go from 'There are some flakes here which do not look like Upper Palaeolithic blades' to 'These are Mousterian artefacts' to 'These artefacts date to the same date as Mousterian artefacts on the mainland' to 'These artefacts were made by Neandertals.' In each case there is an inferential leap that is not substantiated. My question would be 'Are there no artefacts that look like these in any of the Upper Palaeolithic assemblages?' My guess is that there are, but that, as elsewhere, they have been ignored because of the dominant expectation that Upper Palaeolithic industries consist of blades. In the absence of even one illustration of artefacts it is impossible for anyone to know whether the attribution is reasonable. Even if the authors are qualified to be wedded to the inevitability of the Lower, Middle, Upper Paleolithic sequence, they need to establish the veracity of their claim that the occupation was genuinely a) Mousterian and b) of the same date as the Mousterian on the mainland and c) that only Neandertals made Mousterian assemblages (well, at least we know the answer to that--skeletally modern humans made Mousterian assemblages at Qafzeh in the east Mediterranean). Finally, because this has been an exhausting week for silly claims about archaeology by people unqualified to make them, the maps are disturbing. Figure 8 looks as if the short crossing between Lefkada and Kefallinia when sea-level was -120m was in the order of 2-3km. The question we need to be asking is: what sorts of water crossing were possible for hominins at different times. I have always championed the importance of the sea-crossings that brought people to Australia. (And forgive me a moment's rage--there are some quite good sources about this published by people who actually know something about Australia. Why do European scholars think that the only good source is a European one?) But the point is that to make those crossings, watercraft did need to be constructed, because to get to Australia several crossings were needed and one of them was more than 70km. But the point I have tended to neglect is that there were also rivers to be crossed on the way: at very least the Nile, the Euphrates/Tigris and the Ganges. How wide were these crossings and how were they made? If we accept all of the other unsubstantiated assumptions involved in this paper, we may simply be looking at crossings that must have been commonplace at the time modern humans were moving out of Africa. Iain Davidson, March 3, 2012. He's wired into the comments, so fire away. And may the best paradigm win! I should put in a disclaimer about Rob's exaggeration of the extent of my knowledge, particularly of Middle Eastern stone artefacts. Hope no one who reads it takes offence at that. Delicious and well-placed skepticism! Thank you Iain. It has indeed been an exhausting week for silly claims by people who should, but don't, know better. Attributing surface finds to any particular set of hominins is a very risky game. I've amended my comment about the Near East. Sorry for any embarrassment I may have caused. I'd like to add my skepticism of this paper. Unlike Iain, I'm not willing to give the authors the benefit of the doubt on their geomorphological results. 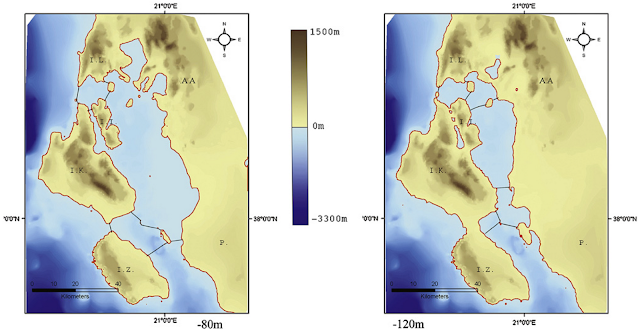 To begin with, their bathymetric profiles reveal numerous non-conformable surfaces at all depths. Secondly, they deal inadequately with the net effect of a basin subsiding due to tectonism. Finally, it seems to me plausible that as the Mediterranean sea level rose at the terminal Pleistocene, and as the basins between the Greek mainland and the Ionian islands filled with water, the effect would have been two-fold--the basin sediments would have been compressed and isostatically depressed by the newly added weight of an ocean, and not insignificantly, I have no doubt that by effectively turning a narrow embayment into a straight, the rising sea level would have initiated a current system that would undoubtedly have scoured the basin sediments. All in all, it's quite possible that the islands were never insular during the last glaciation. I'd be interested to hear what others think about this. I think scepticism should be applied to may of these claims. But having done a bit of swimming and the odd river crossing there is a different perspective to be gained from practical experience. Any river is crossable if you have the time and the ability to move location and wait for things like floods to go down. Similarly 2km isn't all that far to swim - my nephew and his wife regularly do ocean swims far longer than that. With some form of boat, the range is much greater provided you are prepared to work with the wind, currents and weather. Actually its not that much of a big deal unless you are viewing it from a theoretical perspective because it looks difficult in theory. However whether early hominids had the same skills and ability is a different question as is when they did it. Knowing Rhys's reputation, and having seen Jim Allen in action, I'm gonna bet that 'experiment' with the two of them was fueled and insulated by ethanol!